Scholarship winners: Back row, from left: Lena Hanschka, Isabella Quinones, Nayson Peres. Front row, from left, Paulo Pereira Filho, Danielle Hopkins and Liam Weiland. 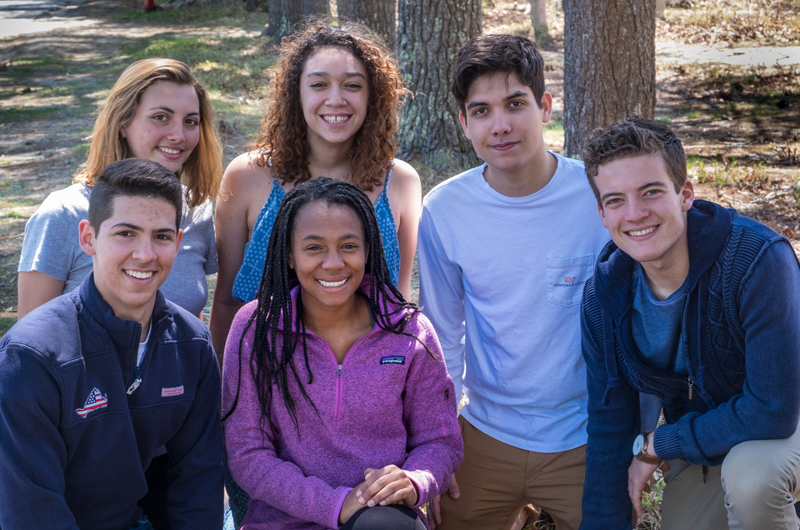 Six Martha’s Vineyard seniors will receive four-year college scholarships thanks to MVYouth, the community fund announced this week. The scholarship awards total $700,000 and also mark a first this year, with one scholarship going to a graduating senior from the Martha’s Vineyard Public Charter School. Isabella Quinones, the charter school grad, will attend Wesleyan University. The other five scholarship winners are: Paulo Pereira Filho, who will attend the University of Massachusetts at Amherst; Lena Hanschka, who will attend Colby College; Danielle Hopkins, who will attend Barnard College; Nayson Peres, who will attend the University of Massachusetts at Amherst; and Liam Weiland will attend Berklee College of Music. All are seniors at the Martha’s Vineyard Regional High School. The scholarship winners were chosen from an original pool of 51 applicants that was narrowed to 12 semi-finalists. Academic merit was the principal criteria for choosing semifinalists. After that the group was evaluated using three broad criteria: academic performance, character and community service. The students this year were notable for their diverse range of interests and accomplishments, a press release said. MVYouth’s college scholarships offer last dollar funding to students who lack sufficient funds to attend their school of choice. The scholarships help fill the financial gap that remains after families contribute and schools offer their own grants and scholarships. All told, in the coming academic year MVYouth will fund 18 four-year scholarships for Vineyard students. This year, MVYouth will also pilot a new scholarship program in workforce development scholarships. The scholarships will be available to students pursuing careers in health care and the construction trades. Applications are presently being evaluated. Founded in 2014 by Daniel Stanton and Jim Swartz, both seasonal residents, MVYouth now has the support now of 59 donors who have each pledged $25,000 per year for four years. The fund will give more than $1.4 million to the Island community next year between its two programs — expansion grants and scholarships. For information about the programs, visit the MVYouth website. I know two of these young people and they are so deserving of this award. My personal thanks to the MVYouth program. Hat's off to a deserving group of young people who are our future.